A little bit about ourselves and how this business came about. Being in the industry for many years we found that as in any business we always encounter problems along the way, some of which take up a lot of our time and cost money to find solutions and these solutions are not always readily available and are not always of the best quality. From our perspective, managing any food & beverage outlet on a daily basis we need to ensure that we are fully stocked with all the necessary food and beverage items as well as all catering supplies, cleaning products, till rolls and everything else needed within that particular outlet, not to mention all the maintenance involved and other important areas. We found that even when a store is in a good space and running according to plan, we still encounter problems somewhere along the line. Wouldn’t it be nice to have a tool that can help us when we desperately need solutions to these problems without having to take time out of our busy schedules, and this is how the idea came about. We thought, what if we create one central place where we can find everything that we are looking for!? And so the journey began. Our vision is to create one place, one place with all the solutions, one place where you can find any supplier or any service provider, one place where you can save time and money, one place available online 24 hours a day, 365 days a year, one place catered to all your needs. This place is called Restaurant Assist and it’s absolutely FREE and simple to use, all you have to do is climb onto our website and we have laid out all the ground work, everything has been categorized and to make it even easier you can search for what you need or simply send us an enquiry and we will try to assist you with whatever you need. Our vision is one that meets with all your needs and comes with no obligations. Our team consists of various people that are all dedicated to helping you to the best of our ability. We have 2 main directors that are hands on and willing to help you at any time with whatever your needs, you can contact JP Pereira or Paul de Almeida directly or you can deal with one of our representatives. We also have various people involved in areas that can be of use to you, for example we have dedicated labour relations people, staff employment people and other areas of importance ready to help you. Contact us whatever your needs and we will be sure to assist you in the best possible manner. 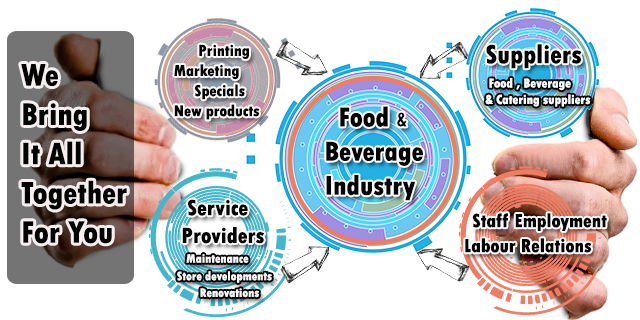 We offer you the service of helping you find suppliers and service providers necessary in running and maintaining your individual outlets and we have over a thousand outlets in Johannesburg and Pretoria utilising our website on a daily basis and this amount keeps on growing, on the other side we offer advertising to all suppliers and service providers that offer their products and services to the food & beverage sector, this includes a dedicated profile page with all your information linked up to all pertaining sections on the website. You would be advertising your products / services to a targeted market and this can be done for as little as R199 per month. As mentioned above we pertain to the entire Johannesburg region and parts of Pretoria, but we will be expanding to all other main regions in South Africa soon and our network of companies can also sometimes assist in other regions.